Week 8’s slate of games came and went with plenty of standout defensive performances to feature. The usual suspects made their presence felt on Sunday in addition to some new names and big bounce-back candidates. Dee Ford continued his breakout campaign against the Broncos, dismantling the opposing offense to the tune of three sacks, five hurries, four defensive-stops and two forced fumbles. The fifth-year outside-linebacker is quickly establishing himself as one of the most lethal edge defenders in the NFL. To nobody’s surprise, Aaron Donald was a game-breaker again on Sunday. He harassed Aaron Rodgers all game, forcing the veteran quarterback out of the pocket and amassing two sacks, two hits and three hurries in the process. Donald also generated three defensive-stops and produced a pass-rushing productivity of 18.5. He continues to be one of the best defenders against the run and the pass, anchoring the Rams defense as they continue their assault on the league. Mason Foster stood out against the Giants in a big way. He was a one-man wrecking crew, producing 10 tackles, three assists, and seven defensive-stops. He played just 14 snaps against the run, yet he racked up an eye-opening five run-stops, good for a 35.7% stop percentage. Rookie cornerback Jaire Alexander is making a serious push for Defensive Rookie of the Year honors. Versus the Rams, the rookie was targeted at a high rate, as evidenced by his 4.8 coverage snaps per target. Even though he was targeted nine times, he allowed only four receptions for 80 yards and a passer rating of 76.2 when targeted. Most impressively, he forced every incompletion that was thrown his way, as he broke up a staggering five passes. The Packers’ cornerback also collected seven tackles and a defensive stop. Jessie Bates has had a strong start to his rookie year, and that strong start continued against the Buccaneers. The safety produced five tackles, a tackle assist and three defensive stops, but he continues to make his mark in coverage where he intercepted a pass and broke up another. Bates was targeted eight times, yet allowed only three receptions for 34 yards and a lowly passer rating of 11.5 on throws into his primary coverage. The Bengals’ safety allowed just 0.57 yards per coverage snap and continues to prove his ability as a playmaker each week. Damon Harrison made headlines when he was traded to the Lions in the middle of the week. The veteran interior defender instantly gave the Lions’ run-defense a boost to the tune of seven tackles, seven defensive-stops and he even chipped in a sack for good measure. Though the scenery may have changed, “Snacks” sure hasn’t. Look for him to continue to dominate the run this season. Saints defensive end Cameron Jordan continues to perform like one of the best defensive ends in the league and his outing against the Vikings was no different. Jordan finished with five pressures, a batted pass and turned four tackles into four run-stops. Another Green Bay Packer had an impressive performance on Sunday but didn’t necessarily have the box score numbers that many look for in a standout performance. Mike Daniels made life hard for the typically well-oiled machine that is the Rams’ offense, producing two tackles, two defensive-stops, and a whopping eight pressures. 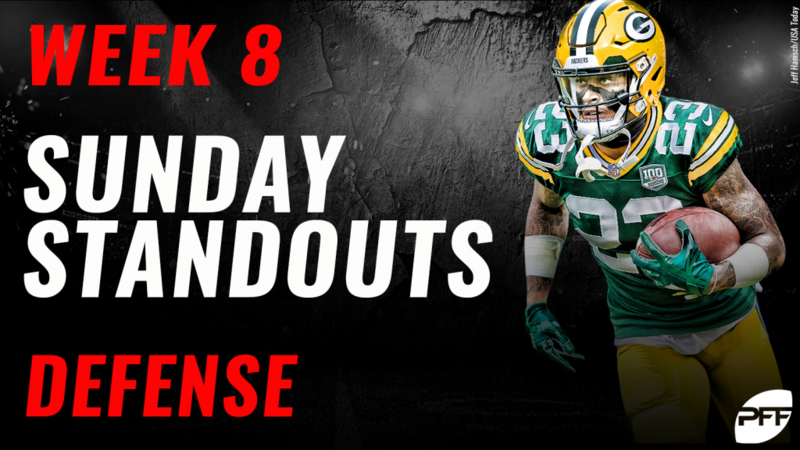 The box score numbers won’t catch your eye at a glance, but don’t be fooled- Mike Daniels had one of the top performances from any defensive lineman on Sunday.